In 1906 an attempt was made to blow up the foundry of Ravitch Brothers on E. 136th St. The New York Times, 6 March 1906, p. 1, reported, "The foundry is a non-union shop, and it is alleged by the firemen and the watchmen that union men are responsible for the explosion... The same firm had a derrick dynamited at 115th Street and St. Nicholas Avenue two weeks ago, and at that time the firm laid the blame on the Housesmiths' Union... [The foundry] is a two-story structure extending for about four lots. The explosion was of great force. It tore off the roof over half of the distance of the building, wrecked the machinery, and tore the place up generally." Joseph Ravitch died in 1950, age 76. His obituary in the New York Times, read in part, "Joseph Ravitch, retired president of the Ravitch Brothers Construction Corporation, died on Thursday in his home at 230 Central Park West... Born in Russia, Mr. Ravitch came to this country in 1888. He founded the Ravitch Brothers Iron Works in 1906. It was one of the largest makers of structural steel in the New York area at that time. Afterward he launched the construction firm, from which he retired in 1944. Many well-known apartment buildings in the city were the work of the firm. These included 320-330 Park Avenue, completed in 1914 and one of the earliest of the modern steel frame apartments on Park Avenue; also the Beresford and the San Remo, at Eighty-first and Seventy-sixth Streets, respectively, on Central Park West, built just before the depression, and still dominant among the buildings facing Central Park. He also built 1372 Broadway - a pioneer garment center structure - and 927 Fifth Avenue." The date 1906 cited in the obituary seems a bit late for Ravitch Bros. New York city directories listed Ravitch Bros. as early as 1895. The first listing has them located on Chrystie St., and the address 61 Rutgers St. is given from 1896 to 1900. 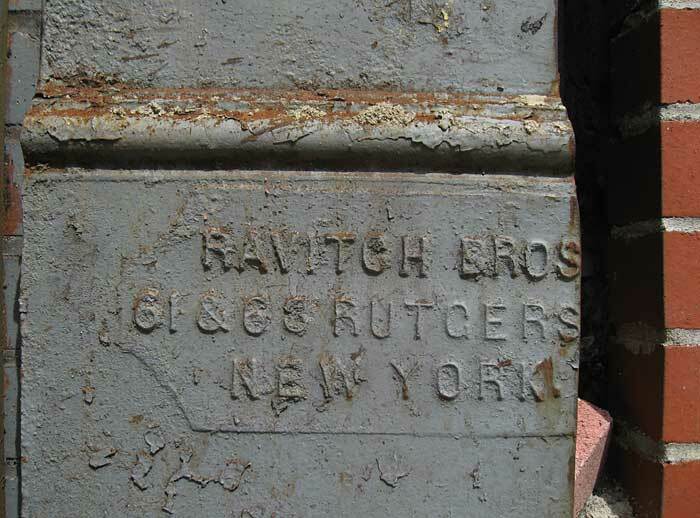 New York telephone directories list Ravitch Bros. at 61-63 Rutgers St. from 1897 through 1899. In 1900 their address changed to 81-89 Mangin St. The foundry mark pictured above likely survives from a shop front cast during the modest beginnings of the Ravitch Bros. in the late 1890s. This advertisement for Ravitch Bros. appeared in the exhibition catalog of the American Institute of Architects, Brooklyn Chapter, 1905. Ravitch at this time was located at 81-89 Mangin St. The same address appears on these vault lights found on E. 110th St. This ad for Ravitch Bros. appeared in the Building Trades Employers Association Bulletin, 1908. In 1908 the company left downtown Manhattan (Mangin St.) and moved their offices to 1 Madison Ave. The foundry was located in Long Island City, Queens. Another Ravitch foundry mark is found on Chrystie St. This also bears the address 61 & 63 Rutgers St.